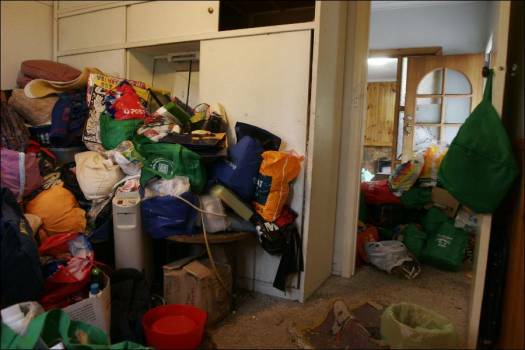 I am fascinated by those TV shows on Foxtel about hoarders. Part of my fascination is the superiority factor: “I may not scrub the shower as often as I should but at least I don’t have rotten pumpkins dotted here and there” *. I also find the very real and complex mental illness behind hoarding intriguing. It seems to affect people of all ages and socio-economic backgrounds, but the wealthier you are the easier it is to hide the problem. Anyway, the other night I was flat out on the couch watching Hoarding: Buried Alive. These people have heaps of STUFF, rooms full of STUFF, houses (yes, plural) of STUFF, a high percentage of it completely useless or worthless. This is NOT my house. I promise you. to do anything about your STUFF when you have so much STUFF. Where the heck would you start? And all the professionals in these shows agree that unless the hoarder has to be in charge of culling their own STUFF. They have to do it themselves, which applies to any good cull of STUFF, which sadly leaves me as the chief packer/sorter/culler of STUFF. Fortunately, I am a very good chucker of STUFF. There’s very few things that I have a problem parting with, even books which are my ‘passion’. I started sorting our STUFF with the kids bookshelf. One box has been donated to charity and there should probably be more. The next target area of STUFF is a rather ugly faux-wood laminate entertainment unit we inherited from somewhere when we first shacked up together about a trillion years ago. I have no idea why we still have it as neither of us likes it, but we do. And it holds a plethora of very useful STUFF. My tongue is firmly in my cheek when I say useful as it actually houses my husband’s stereo system he got for his 21st complete with record and tape player and one of those new-fangled VD thing-a-me-jigs! Hence, it also houses our records vinyl collection as well as the dinner set I got for my 21st, crystal bud vases, tarnished silver goblet from my 18th, and a huge collection of souvenir wine glasses from various places. I may have to brush the cobwebs off the wretched thing when I open it, as it is so rarely opened. Why have we kept this STUFF? I blame apathy. We need none of it, but I really can’t part with our records. I mean vinyl collection. Which means we need to keep the stereo, because how else will we play the 12inch version of Uncanny X-men’s 1986 classic I Am? But everything else will go. Oh, except for the dinner set because my mum gave it to me for it for my 21st. Hmmmm…..for someone who considers themselves rather adept at chucking STUFF, I seem quite adept at finding reasons to keep STUFF. * as I saw in one episode featuring a food hoarder. This entry was posted in Packing, Uncategorized by KJ. Bookmark the permalink. Frighteningly, today I heard if you are severe enough, they can take your kids away. But on the upside, I guess that would leave you a lot of free time to tidy?